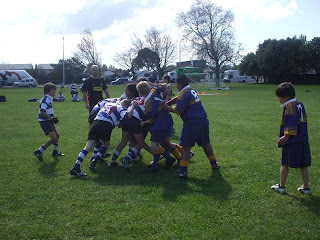 Early on in Term 3 most of Addington's senior school went to Southbridge school to play some sport. It was a great day out there, and Southbridge wanted to return the favour by coming to our school for another day of sport. 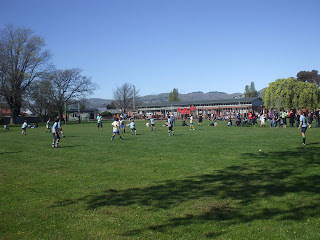 So on Tuesday morning, 60 children (4 sports teams) were welcomed at our full school assembly by Nga Matiko, Te Tipuranga, and Ms Heath. 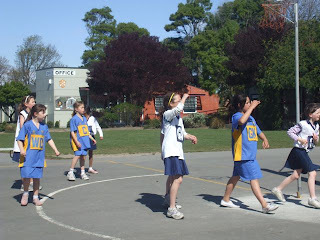 After a delicious morning tea (put on by the Addington PTA), we went out to play our sports. First was soccer, which our team won 9 :1. It was a tough but fun game. Then it was the Netball B teams turn. Again we won 9:5. 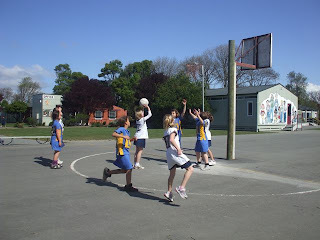 After this the A Netball team played and they lost 26:9. This was a very tough game. Last game was the Rugby which we won 24:14. This felt really good because the teams had tied at Southbridge. All the teams played really well and worked together to the end. They all showed resilience, persistance, passion and personal best. Fantastic Addington attitude. After the games we all gathered together in the hall, to eat ice blocks and chat with our new Southbridge friends. Then we said our goodbyes and they hopped on the bus and set off to Southbridge. It was a fun and spectacular day that we all enjoyed and hope to do again sometime soon.